Barcelona proved they are still the team to beat in Spain by recording a 2-0 triumph over Sevilla in the Spanish Super Cup first leg at Estadio Ramon Sanchez Pizjuan, and they will be looking to finish the job in the return match. 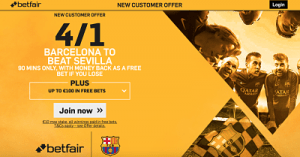 It is clear that los Rojblancos will need some time to gel after signing a host of new footballers and with that in mind you should be aware that Betfair has enhanced the price on Barcelona to win to whopping 4/1 (5.0). You do need to sign up through this link and enter promo code ZFBCJM. Then bet on Barcelona to beat Sevilla at the enhanced price and you will also be entitled to receive up to €100 worth of free bets.